This time – I keep it! 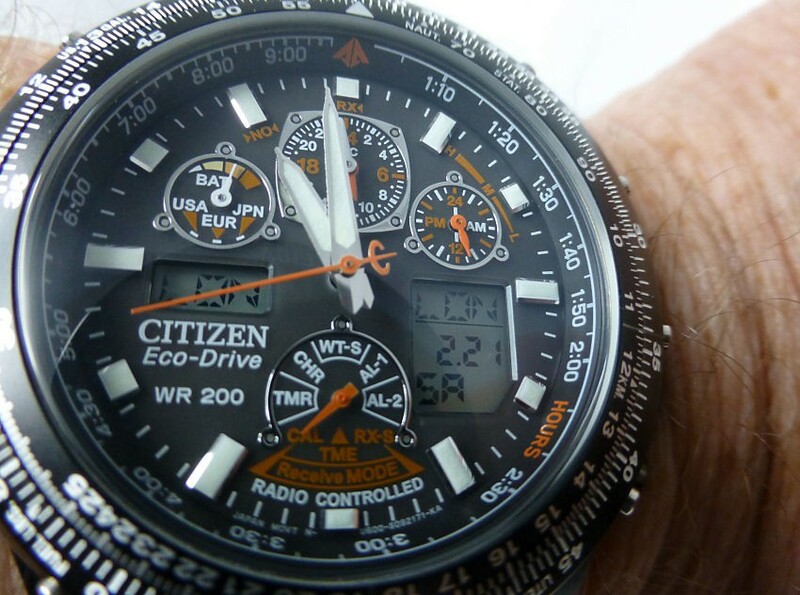 As discussed on the last Post, after selling on my older model Navihawk, I managed to replace it at long last with this Citizen JY0005-50E Skyhawk A-T Radio Controlled Eco-Drive, which reminds me so much of my older model, AND which has been updated for today with RC and Eco-Drive. 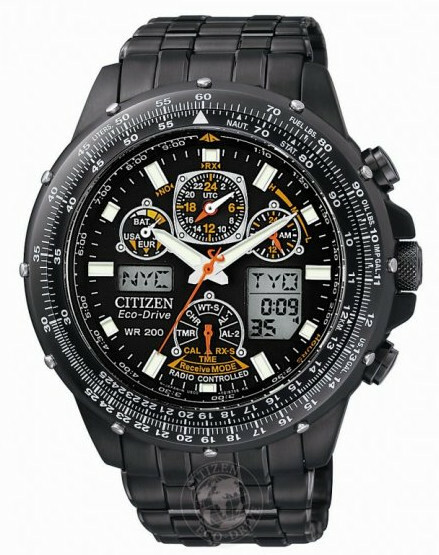 Really pleased with it because in my opinion this is a Classic Citizen model of it’s and probably my generation. 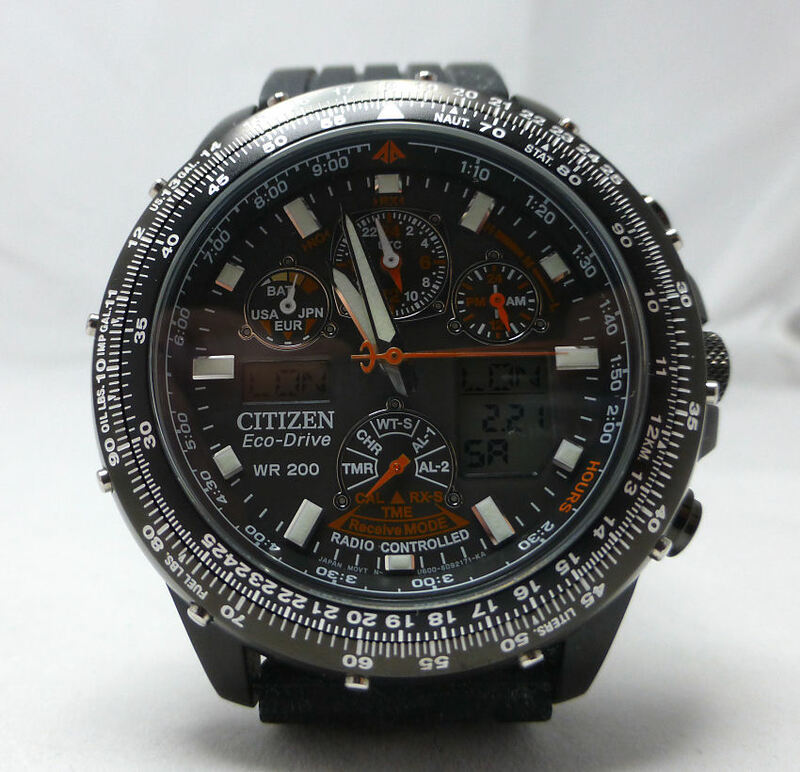 Citizen Skyhawk – home at last. Note the down curving bezel. But for some unknown reason I just wasn’t wearing either one and my mantra in those days was if I don’t wear ’em – they go. I’m maybe a bit more mature today and that rather strict criteria has eased somewhat and I can see the beauty in owing without over wearing, happy enough just to take it out on occasion and have the odd wearing day or week. Skyhawk high data dial configuration works and works well! But to the model – and there is no doubt that it is a very nicely made piece of kit with lots going for it, such as the anti-reflection coated domed crystal and the clever configuration of the entire dial, which is a masterpiece in it’s own right. There’s no question in my mind that they got this right and right at the start too. Another thing I should mention is that I managed to get this at £100 off retail. The funny thing was and this is actual fact, the price dropped just after my last Post (we’re talking a day ago!) and as this was both the best price I’d seen and the last one the Dealer had in stock, it was an absolute no brainer for me. Straight on to the web site and that was it! And very happy I did too and as you see I got myself a lot of watch for the money. Skyhawk JY0005-50E – Original steel bracelet changed for Silicon deployment – means 196gms to 110gms! I didn’t in the end buy the Titanium one, which would normally be my preference, purely on weight grounds. 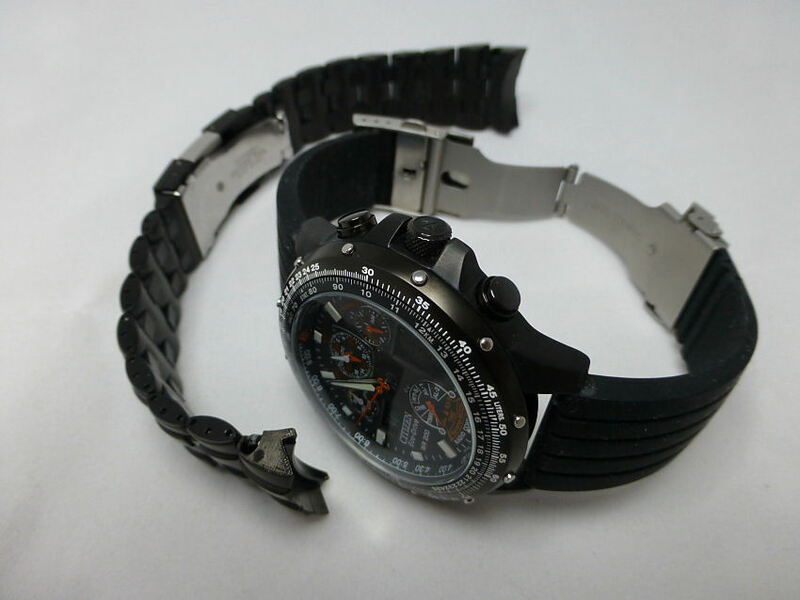 However I solved this minor issue by removing the very heavy steel IP coated bracelet, which believe it or not accounted for 110gms of the total weight of 196gms, or heavier than the watch itself. Fitting a silicon deployment strap made good sense and the resultant all up weight is now just 110gms, which is actually 10gms lighter than the Red Arrows Titanium JY0110-55E version of this watch, so I’m very pleased with that. The watch with it’s U600 movement is of course a delight to use, easy to set and once on auto in regards Radio Control is a forget watch. Get yourself a Radio signal at 2am, 3am or 4am and the time is corrected as good as you’ll get. Summer/Winter times are automatically accounted for in settings (Auto) and to change Home time for Destination Time if traveling is simple to do. Crown out to Pos 1, turn to select city shown in display 1 on the right, press buttons A and B simultaneously and the new time jumps to display 2 on the left and the old Home time moves to the 1st display on the right, push in Crown – job done! Once on the way home just do the same again, but this time simply pull out Crown to Pos 1, press A and B together, Cities move over, push Crown in – job done. So a very easy to use World Time traveler. With the Citizen penchant for displaying data, the Charge Indicator @10 shows the current state of charge and it also doubles as transmitter indicator for your area. In other words, when Receiving, the little indicator will point to USA, Eur or Jpn. At the same time the Second hand will point to H, M or Low signal strength at between 1 and 2. So it’s very simple to see what’s going on at any time with this dial layout. The lower indicator sub-dial is the Mode selector indicator, which moves around to point or indicate your Mode selection, such as Time, Cal, Timer, Chrono, Alarm 1 and 2 and World Time – so again very easy. The digital display 1 on the right will show the selection start point. Skyhawk JY0005-50E at 45 mm diameter fits well with silicon strap. By the way when the watch arrives in it’s box it may well have no charge at all, so before anything you need to stick it in the daylight for around 8 hours. Then it’s ready. After you’ve done this you’ll see it’s ticking away with Displays indicating and probably not the right time or date of course, but later that night you need to do a Manual Radio Receive. Easy to do. First you need to set your Home City/Zone. Note you have two Displays. Display 1 on the right and the smaller Display 2 on the left. Display 1 is your World Time selection. Display 2 is always your Home City selection. So to set your Home City/Zone start by pulling the Crown out to Pos 1 and turn the Crown either direction to scroll through all the World Times on Display 1. When you get the one you want, leave it showing on Display 1 on the right. (Note when you pulled the Crown out, Display 2 will flash “M”, which means it’s in “Mode” setting ready for display switching). Now the City you selected (your Home City) is still showing in Display 1 (on the right). To move this city to your Home City Display 2 position, press both pushbuttons at the same time. This will transfer/copy the City from Display 1 to Display 2 on the left. You’ll see on my watch here that my Home City is set to London on Display 2 (left), and also on Display 1 which still shows the World Time of London. This display can also show the Month, Date and Day. Or the Time with seconds running. It’s all pretty easy to do once you’ve managed it once, so no continual reference to the instruction booklet needed. When traveling it’s also very easy to select a Destination Time Zone. Basically your Home City is on the left Display 2 and the new City or World Time destination City you select is on Display 1. And you simply swap them over more or less as you already did above. So a very good travelers watch. Of course the watch is also a Calculator, Pilots delight, Motorists and Nerds friend with all sorts of calculations possible using the bezel and indexes on and within the dial, hence the text everywhere, though if you never use them, it’s OK as they’re not actually obtrusive. The Hour and Minute hands are quite broad with great luminous infill and have a considerable separation above the dial, so stand out very clearly. The sub-dial indication @12 is the UTC 24hr time and the one @2 indicates 24hr AM/PM, so again good data and well displayed, yet unobtrusive to the main time function. 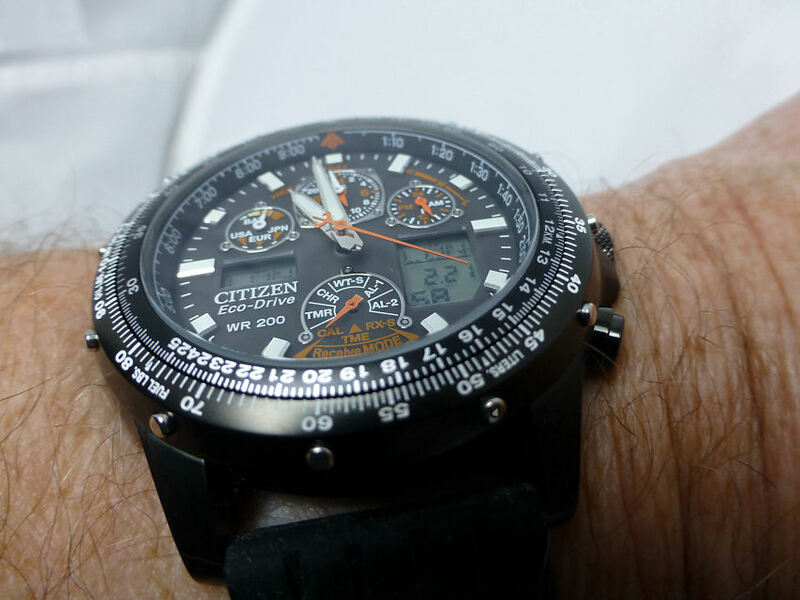 Note that unlike some other models, Citizen this time have ensured that the sub dial surrounds are really thin and don’t interfere with time reading when light levels are low. The main 0-12 markers are broad with great luminous qualities and the watch is extremely easy to read at night. There is also a digital display light operated by the top button which is very clear indeed. The watch case is very well made and surprisingly smooth and I particularly like the bezel as it’s sleek and curves down at the edges. 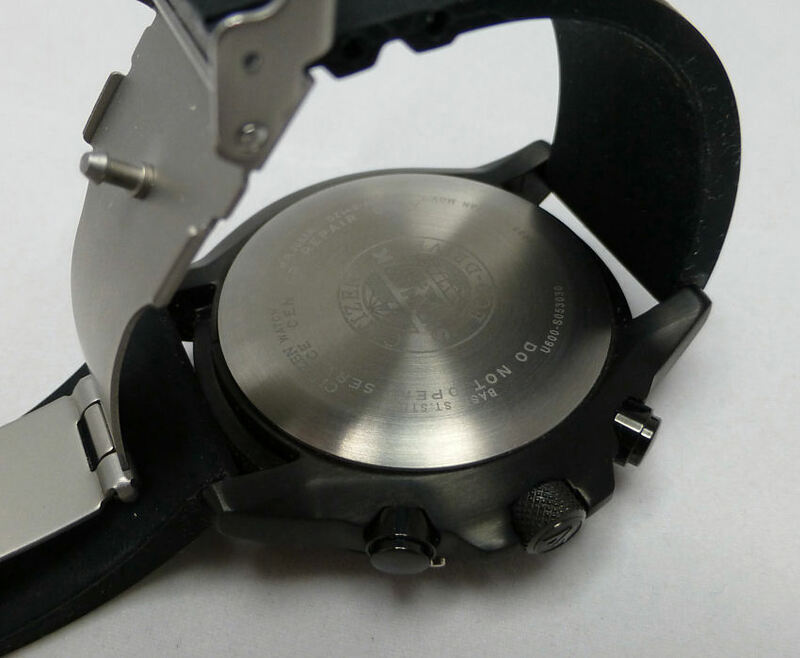 It is of course bi-directional being a calculation instrument and not a Divers model, though that said this model has a commendable 200m Water resistance. The central knurled Crown is protected by the case and the buttons are smooth and easy to operate. I also love the back of this model as it’s very plain but in brushed stainless steel and is not designed to be opened by anyone other than Citizen, nor should there be any reason to do so. Dimensions are not too bad for today at 45 mm wide, though I am glad to see the lug to lug is a neat 49 mm, which means this watch can fit the smaller wrist without overhang, and the depth or height of the case is 15 mm. The IP coated steel is smooth and has a subtle brushed satin finish, not glossy at all. The bracelet supplied is a standard 22 mm lug width and uses standard spring bar fixings, so alternative straps or bracelets can be used easily and as I’ve done already. Another real plus when compared to many of it’s competitors. Out of the box first impressions are this is a big, solid and heavy watch, yet remove that very heavy bracelet, fit a silicon deployment strap and it’s suddenly not just very much lighter, but seems smaller and fits neater on the wrist. I’ve included a few images to try and show it in a more realistic light than you see on the Internet, and I’ll take a shot or two at night to show the luminous and display light aspects, though I’ll post the night shots later. The luminous quality is very good indeed and hands and markers still very clear after 6+ hrs total darkness. Added to that the digital display light for both Displays is excellent and very clear indeed. Certainly one of the better night use watches I’ve seen from the big three. So after all that – I eventually got my Skyhawk and OK it’s not the old Navihawk and whilst I might have got a more lookalike model such as the Blue Angels (if still available), I’m really happy with this one – in fact I love it . . .
Is there a Downside? – well if honest, it is a bit larger than my old one, which seems inevitable these days – my old Navihawk was around 40 mm diameter against this one at 45 mm and it’s very much heavier, though I’ve fixed the weight issue by changing the steel bracelet for a silicon strap, with the result it’s now actually lighter than both the old one and the new Titanium version, so that was easily solved. You can of course have a silicon strap version of this model (cheaper) though I wanted the bracelet basically as if I did sell it on . . . which in this case I’m definitely not going to do, it would have that option. Anyway the Upside of this model far outweighs any negatives, as this watch is very much updated for today with addition of Radio Control and Eco-Drive and the inclusion of a Crown and only two pushers makes a neater and certainly easier operation, plus the more advanced U600 movement module, are improvements that really do Citizen justice without diminishing their concept. And of course it’s on my wrist! And one thing that is certain – it will not be sold on, not this time . . . . no way! Note 2 – The Attesa I refer to is a Citizen model I bought in 2009 and was probably the real upgrade model of the original Navi/Skyhawk concept – cleaned up and much more advanced and yet – well click on the Attesa in the Post (the paragraph below the first image above) and it’s article is there and the note at the foot explains all. Interestingly I see the latest Skyhawk has moved the slide rule, bezel data indexes inside the dial. This unfortunately is starting to look just a little cluttered – unlike my model. 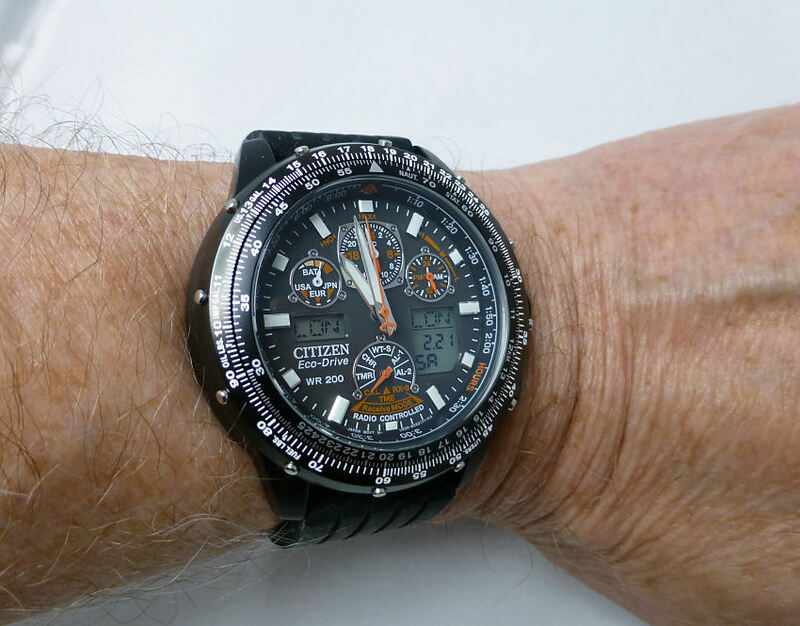 It appears Citizen may be going too far though I hope not, but the Promaster Skyhawk PMV65-2272, seems perilously close and nearly £400 plus mailing costs from Japan. However on the plus side I note it has nice short lugs and a standard strap fixing, so that is a big improvement. Ah well perhaps you can’t get everything . . .
How could I . . .
Just thinking the other day how could I manage to sell on my old Citizen Navihawk and realizing afterwards what an idiot I was. Maybe it was the fact that I was still looking for new things and it wasn’t being worn as much as I liked. Or maybe it was the technology at that time and maybe it was me that wasn’t ready for it, or it had too busy a dial or whatever – I simply don’t know and that of course was as I now realize – regrettable in the extreme. For it was a classic of it’s time and I should be wearing it now – but alas not to be . . .
My old “techno 3” – or what I thought were the greatest. But only one remains! Today of course fortunately there are models that are now the offspring of that great watch and fortunately they have improved them and not messed around with that amazing dial construction, which let’s face it was the attraction that so many of us felt at the time. My old model for example didn’t have Eco-drive and didn’t have Radio Control and it was stainless steel, though in fairness it was very neat on the wrist, as most watches were smaller than today’s counterparts. So I thought OK I messed up last time and today I’m going to make amends for passing up a classic of it’s era. 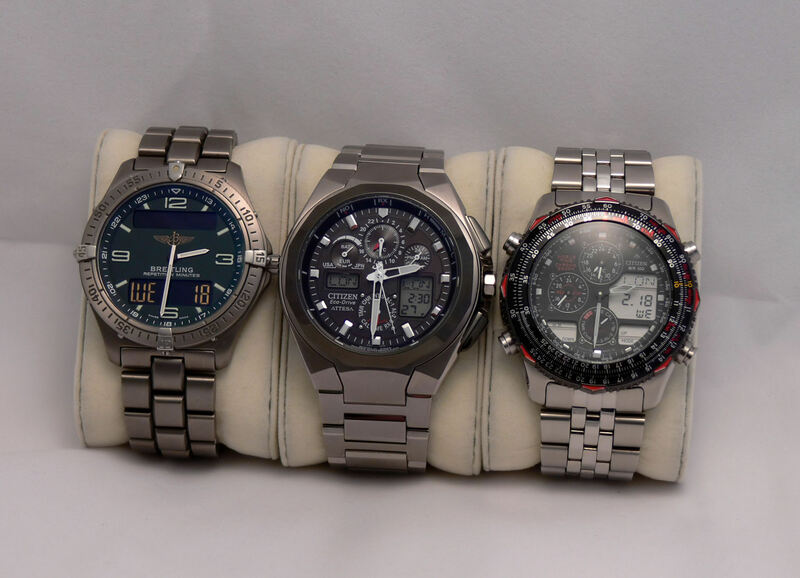 Yes I’ve decided I’m going to get myself a Citizen Navi or Sky something and it’s going to be a keeper! And there are a few around, though some don’t have that “look”and some seem larger, not as neat, so I’m being careful here because it’s important to me – this time. At one time I had what I called my techno 3, that is the models I thought were the latest thing. The Navihawk, the Attesa and the Breitling – and would you believe of the trio I only have one remaining and it’s not the Citizens, but my Breitling. But and it’s a big but – what Citizen model will I choose? Well there are quite a few models to pick from and they all have little differences and at the end of the day it’s about personal preference. It’s about the one that “says” it for you and I remember so well that my old one did just that and for whatever reason. So after a lot of looking and examining and thinking how I feel and so on I have a choice of two. 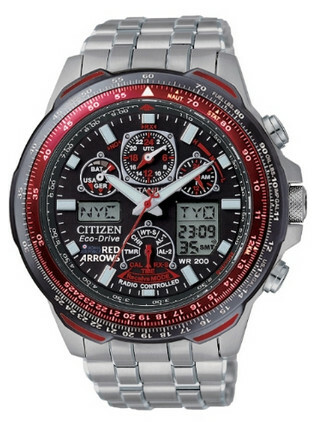 Either the Citizen Skyhawk model JY0110-55E Red Arrows Titanium AT or the JY0005-50E Skyhawk Radio Controlled, Eco-Drive AT model. Why I picked these two versions over others is just the feeling that they have the “look” of the old one with that curved bezel look, the short round buttons as opposed to the T shaped pushers others have, and just two not four plus an added crown, which eases World Time changing over the older model. I also like the different bezel grips, elongated in the first one and dot protrusions on the other which reflect the original bezel grip idea and I prefer that both hour hands are NOT skeletal (my only dislike on my old model). Functionality wise they are both identical and both models are now Eco-Drive, so no battery concerns ever and being Radio Controlled there are no accuracy issues when changing time zones, each of which is an improvement. One is Titanium and the other is IP Stainless Steel so one is lighter on the wrist, and both have short case lugs, which are wrist friendly and they’ve improved the water resistance from 100m to 200m. The indices on both I note are heavier which aids clarity and both digital displays are slightly different in layout and smaller on the right side, but with larger digits than the older model, and with the addition of better quality anti-reflection coating inside the glass these should have better overall clarity. All good and yet without compromising that indefinable element of what attracted me in the first place. They both in their way look right. Which will I finally pick is down to how I feel and at this moment I’m favoring the JY0005-50E owing to dial coloration in and on the dial and maybe the bezel grips? I also note that the IP Stainless model is considerably cheaper by around £100, which is important especially as functionality is the same. Though on the other hand I do like Titanium! I also like the fact that one of them has marginally less dial text (no Red Arrows). Yikes! this is NOT easy! It’s also true to say, that whichever one I choose, that this is one of the classic Citizen milestone models which basically has hardly changed cosmetically from the day it first appeared. Always a good point in any design is when they get it right from day one – and that’s a feat in itself. It was a winner then and it’s a winner now. The model I’ve picked (yes I’ve made my selection) will be featured as a more in depth subject of a near future Post. One thing is so obvious when the watch is in your hand and that’s the fact it is a Citizen Classic. The wonderful analog/digital dial layout (which some said would never work) and function combination, heralded a new age in digital watches and Citizen to my mind came of age with their introduction. The addition of Radio Control and Eco-Drive to the range is a logical extension and will ensure the popularity of the Navihawk and Skyhawk to a new generation.